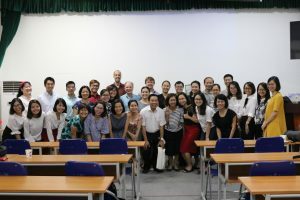 The seminar was attended by Dr. Lam Quang Dong – ULIS’s Vice President, scientists and researchers inside and outside Vietnam as well as foreign language lecturers and teachers. 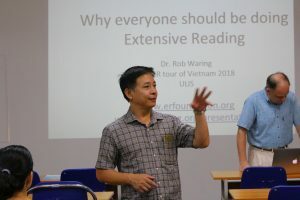 The seminar focused on the contents of extensive reading method, practical issues, existing problems and solutions, which were presented by three speakers, namely Dr. Rob Warring (Notre Dame Seishin University), Todd Beuckens and Paul Goldberg. Delivering his opening speech, Vice President Lam Quang Dong extended his greetings to the speakers, scientists and researchers attending the seminar. The Vice President expected those participating in the seminar would achieve success regardless of wherever they come from or whatever fields they work in. Presenting at the seminar, Dr. 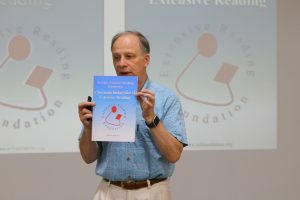 Rob Warring shared necessary documents for the extensive reading program. 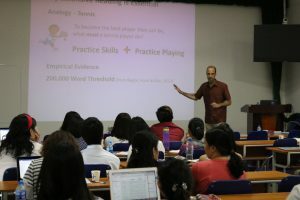 He believed that English learners were studying too much abstract knowledge instead of focusing on common vocabulary and ways to communicate. He also provided some useful information sources for reference besides direct interaction with the scholars in the auditorium. 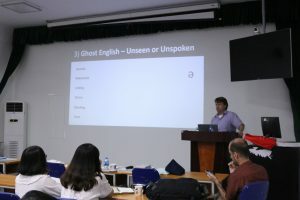 Todd Beuckens showed some short clips to help the scholars in the seminar listen and distinguish different pronunciations as well as silent letters in English. He asserted that it was necessary to understand the indirect way of speaking of native English speakers. He also extended his thanks to ULIS for inviting him to attend this seminar. Paul Goldberg advised the scholars to not only revise English but also put English into practice. He also pointed out the problems existing in the extensive reading method with each specific situation and their solutions. The seminar was closed in full success. Another milestone in scientific research was recorded at ULIS ​​– VNU.